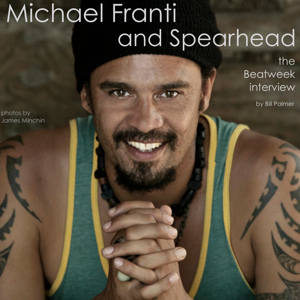 Michael Franti and his band Spearhead spent decades building an audience for their music the hard way, before the song “Say Hey (I Love You)” propelled them to mainstream popularity a year ago. With their followup album The Sound of Sunshine out today, Franti and the gang face the challenge of building on their newfound momentum while retaining what’s always worked for them. The longtime activist and peace advocate tells Beatweek how his life has changed and how he hasn’t, even as his journey has seen him performing in war zones and at corporate headquarters – and how a recent health scare impacted the stories he tells on his new record. Are people reacting to you differently now than they were for the first twenty years of your career? There’s a lot more attention now than ever before, from people who are just casual listeners. My music is getting played in dentist’s offices and shopping malls and stuff. So people come up to me in the airport or whatever and know me. We have a lot of new people at our shows that we’re only seeing for the first time now. And we’ve got a lot of fans who have been there for twenty years and have been coming to shows year after year. So it’s kind of a new mix of people coming. Did that impact you when you went to make The Sound Of Sunshine? This February and March we were touring with John Mayer, and at all the shows we were playing in basketball arenas, and there would be about fifteen thousand people there a night, and maybe ten percent of them had heard our music or seen our show before. So what we did is we played a lot of new songs and we would see how the audience would respond to them, and then we’d go in the dressing room after the show and we had a little portable studio set up, and we would re-record the songs based on the audience reaction. So maybe one night we’d say, you know, this particular song wasn’t fast enough, or we noticed that people had a hard time singing the chorus, maybe there needed to be a different chord change there. In that way, the songs really were shaped by the audience. You ended up releasing two lead singles simultaneously, the title track and Shake It. That’s kind of rare. What was the thinking behind that? All along, for the last ten years or so, we’ve had our songs get played at AAA and non-commercial radio stations, and it wasn’t until this last record with Say Hey that we’ve ever been in the Top Forty, so the label really thought that Shake It would be a great kind of Top Forty song. But we didn’t want to leave out all the stations that had played our music in the past, so they put out both those songs. And ironically, The Sound Of Sunshine is starting to get played by the Top Forty stations. Tell me about The Sound Of Sunshine. I don’t think I’ve ever heard that phrase used before. Last fall my appendix ruptured while I was on tour. I got really sick. My stomach, my whole abdomen was infected, and I had to have major surgery and cleaning out of my whole insides. As I was coming back from that surgery I’d go to the window every day and I’d look out into the sky and see if the sun was shining. If it was, I’d feel this inspiration, like yes, it’s gonna be a great day. And I thought to myself, wow, if I could bottle that feeling for people, that sense of optimism when you first see the sun in the morning, what would it sound like? So that’s what we tried to do, is make songs that had that feeling of being in the sun, and also that newness that I felt, I guess a new appreciation of my family, my friends, of food, of playing music, all the simple things in my life that became more and more important as each day of my coming back from this life threatening illness. Did it seem strange to you that after all this time you finally get your big mainstream hit, and then right after that you have a life threatening health issue? Yeah, it was actually simultaneously. I was in the hospital being wheeled into surgery, and I got a text, “Your song just went into the top twenty.” We’d never had a song in the top twenty thousand before. So for us it was quite remarkable. But at the time it was just kind of like, well, I hope I live to hear it on the radio once (laughs). But to be honest, there’s things that are much more important in my life. And so it kind of came at a really opportune time, I guess, to serve as a reminder that a top twenty hit is a really nice acknowledgment, I guess, but at the end of the day there’s things that are much more important like my friends and family. You just performed at Google. Based on your activism, you might stereotypically think that you might be the type who would be so anti-corporate that you wouldn’t want to perform at Google or any other company. But I guess that’s not the case? I’m not anti-corporate. What I am is, I believe that it takes the resources of the corporate world, it takes the cooperation of government, it takes the ideas of the grass roots, it takes the spending power of everyday people, the voting power of everyday people, and the best that science can offer to address the needs of our world today. In terms of Google, I would rather go in there and hear what people have to say about what’s happening with their policies in China, for example, than I would stand out on the street corner with a sign saying “Go away Google” because they’re not gonna go away. When I got there, what I found was quite the opposite. I found people who were really concerned about that issue in particular. They were really socially minded beyond just Google. They were involved in a number of different social issues that they were trying to get Google involved in, and it was far from any corporate office that I’d ever been to. It was really a place that tried to do everything they could to make their workers feel comfortable, onsite health care, onsite child care, volleyball courts, swimming. All the food that they have there is free for their workers and it’s all really healthy, organic food. So I found it to be a new model of a company, and people there were as concerned as I was about those issues everybody hears about. Are things getting better? Do you see signs of hope in the world or in our country in 2010? I think things are getting better. I mean I thought that the health care initiative, although it was far from anything that I had hoped it would be, was a step in the right direction. Any time we can get insurance for thirty million more Americans, I’ll take that. I wish it had gone a lot further, and now I see that they’re trying to have all of our troops out of Iraq by the end of 2011. I think that’s a positive step. So I see a lot of positive things that are happening, and it’s certainly, in comparison to where we were during the Bush years, I think things are better. Now the economy is something that we’ve really got to get whooped into shape, and you never know where we would be without the stimulus plan. Back to the album, the song Gloria really jumps out. Gloria is a song that I wrote for guardian angels. Not the people you see at parades in New York City on the subway, but guardian angels in our life, those people that look out for us, or the ancestors who are in our life who are watching over us, or whatever people believe are their guardian angels. When I was in the hospital, I had lot of them, the nurses that were there, the doctors, my friends, my family, my girlfriend, my kids. And so I really wanted to write a song that was about my gratitude for those guardian angels.